Most probably fake since I own the entire collection of C&H and I've never seen this one. But still. Those damn kids on the intarwebs. They don't respect nothing! yeah – pills are working. I remember seeing that specific C&H strip or one like it many years ago. And I remember a couple of others where the Hobbes stuffed animal was shown. Hobbes was a stuffed tiger, and was real only in Calvin's imagination. Others never saw Hobbes as anything other than a stuffed animal. Sorry, but that's the way it was. Louis : thanks for explaining the concept of the whole comic books :) But as I said, I own the entire collection so this was rather unnecessary. This particular comic is *not* "the way it was": when other people (kids or grow ups) are definitely seeing Hobbes as a stuffed tiger, Calvin would NEVER do this in the comic. Never. Ne-ver. That is the way it was. I'm pretty sure I've seen this somewhere before, the premise being that Calvin was given Ritalin to counter ADHD. The result is he loses his childish nature and his ability to see Hobbes. Whether or not it's genuine or, as you suggest, fan-fiction… I don't know. Every time I see it, I feel so sad. It feels like the end of a dream. Not 'canon'. I have at some point owned every C&H collection which IIRC spans the whole body of work. 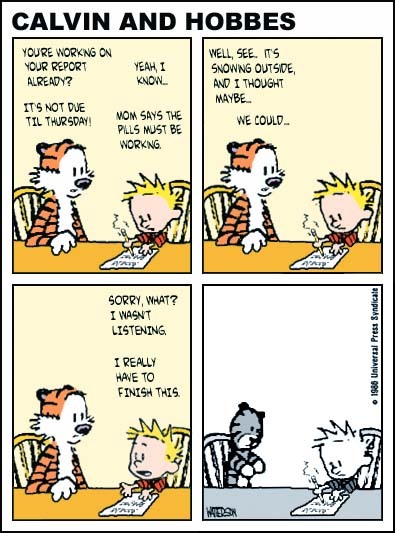 Unless memory totally fails, Calvin was NEVER on mood-affecting medication. Besides, the font's all wrong. Derf. Yeah, I hate whoever made this. I'm pretty sure it's fake, it's not signed by Watterson. I have been living on Calvin & Hobbes for nearly a decade now, and I can guarantee that this is a fake. Anyone who has ever read the 10th Anniversary book and comments by Bill Watterson would know that old Bill would NEVER do this to Calvin. Those who see the essence of Hobbes as "being real in Calvin's imagination but a stuffed toy in everyone else's" fail to understand the true meaning of "reality" and subsequently, the point of Cavlin & Hobbes. though this is definately a fake, i like this because i see exactly what the person who Cannibilized Watterson's strip. This person's point was to use Calvin & Hobbes as an example of what we risk doing to our children when we're more concerned with giving them pills to shut down their "conditions" and make them automotons. you're right: Watterson would never do this in his strip. which is why someone was able to do it long after the strip was retired. if Watterson had done it, it would be the end of the strip. Hence why giving Calvin pills to solve his "problems" is such a sad and terrible thing. and thats kinda the point of this mock-strip. whoa–i need to self edit next time before i post something. i can barely pick-apart what i was trying to say, and i wrote the damn thing! It's absolutely a fake, and it hurts to read, because AAH! He would never! But I LOVE the message that whoever made it was trying to convey. Ritalin and the reckless overdiagnoses of ADHD and all of that awful stuff are some of my biggest personal battles with the world, and one of the reasons I'm going into teaching is to keep kids safe from creativity-crushing drugs. It's the "follow-up" to that cartoon, which is probably more of what Bill would actually do. But yeah, I agree with Colin that I dislike the comic but like what the artist is trying to convey–and it makes me like the follow-up even more. Just a note to Louis Kessler, Bill Watterson himself said he purposely avoided addressing whether Hobbes was alive or stuffed, because he had different realities to different people. «Previous post: Twitter Logo Stealing?